This Vietnamese riced cauliflower is packed with flavor and antioxidants from ginger, mint, lime, and cilantro. This healthy side won’t disappoint and goes great with Green Curry Chicken. I really don’t know what I’d do without cauliflower. It’s so diverse and versatile and it’s easy to find organic all year round. Cauliflower also tops the list of liver-supporting foods. It is a great source of dietary sulfur, in the form of sulforaphane and indole-3-carbinol. These compounds are key to both phases of liver detox and have the ability to detox especially harmful, cancer-causing compounds from the body. 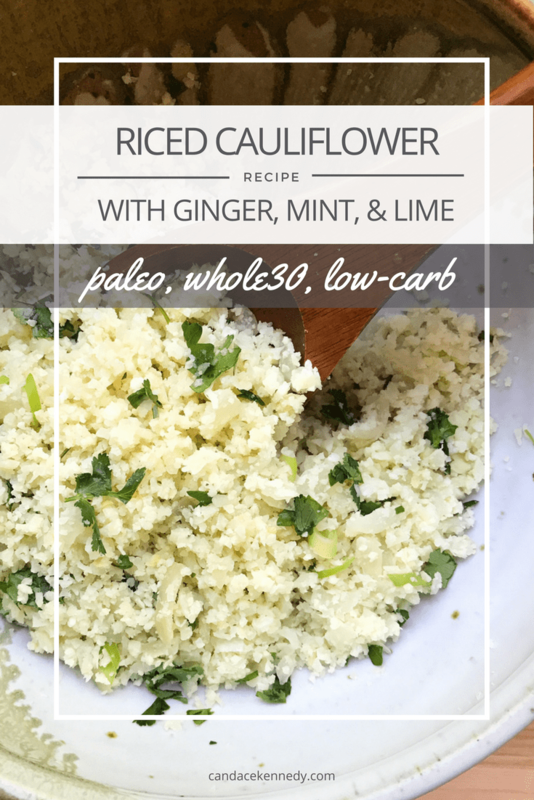 Place your cauliflower florets in your food processor and pulse until the cauliflower is the same consistency as white rice. Heat the ghee and coconut oil in a large skillet over medium heat. When the pan is good and hot, add the onion or shallot and saute until they start to soften, about 3-5 minutes. Once the onions have softened, add the riced cauliflower and stir to combine the cauliflower with the cooking fat and onions. Add the coconut milk to the pan. Reduce heat to medium-low. Cover and cook for about 5 minutes. Add the sea salt, black pepper, ginger, mint, and cilantro to the pan and give it all a good stir. Cook about 1 minute. Remove from heat and squeeze the lime juice into the cauliflower. Stir so everything is evenly mixed. Transfer the riced cauliflower to a serving bowl and garnish with sliced green onion, more cilantro, and/or more mint.